Behind its iconic, red-bordered cover, TIME dispenses page after page of Village wisdom. America's oldest news magazine has managed to remain relevant even in today's shrinking print market, thanks to initiatives like TIME 100, its annual list of the most influential people in the world. And designation as TIME’s Person the Year continues to be perhaps the most coveted honor bestowed by any publication. Notable Figures: Editor-at-large Fareed Zakaria (left); former Managing Editor Walter Isaacson; columnist Joe Klein; columnist Margaret Carlson; film critic Richard Corliss. 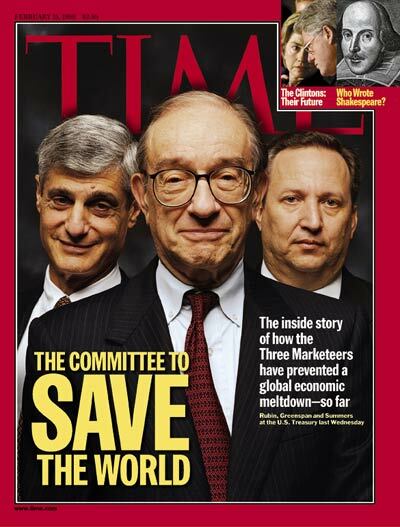 Achievements: Put Bob Rubin, Alan Greenspan and Larry Summers on 1998 cover with the title, “The Committee to Save the World.” Kept Karl Rove's name out of story on the outing of Valerie Plame as a CIA agent. Published affectionate portrait of Goldman Sachs and its CEO, Lloyd Blankfein. Warned against U.S. exit from Afghanistan. Provoked discussion with cover featuring mom	breastfeeding her three-year-old son. Predicted a future of obscurity for Julian Assange. Sounded alarm over the activities of hacktivists with “Geeks Who Leak” cover story.